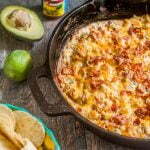 This alambre skillet cheese dip is has got it all: steak, peppers, onions, cheese and yes even bacon! A fun appetizer to celebrate Cinco de Mayo. In a large cast iron or oven proof skillet, brown your bacon and then take it out and set aside. Pour out excess grease but leave a bit to saute the onions for a couple minutes. Then add in your peppers and steak and saute until the steak is browned. Add in the cream cheese, bacon and 1 cup of the Mexican cheese and mix well until melted. Sprinkle remaining cheese on top and bake for 10-15 minutes or lightly browned on top. Add chopped avocados, tomatoes, cilantro or even a squeeze of lime if you wish.